Have you felt the crispness in the air, seen signs of the leaves beginning to change color? Yes, it is FALL, and if you are like me, then you know it is a wonderful time to entertain. For this week’s Tuesday Tip, I am sharing ideas for great, affordable center pieces!! TALL VESSEL FILLED WITH FRUITS OR VEGETABLES – There is nothing more colorful and festive than incorporating fresh fruits or vegetables into your décor. From large green, yellow or red peppers to artichokes, lemons and limes, jars filled with these colorful items can make a real statement! When it comes to lemons and limes, incorporate the fresh leaves of the stem, sprinkling them throughout the height of the jar, this also works when using apples. When it comes to Fall, there is nothing quite as fitting as a tall vessel filled with apples or even colored gourds. SHORT FLOWERS IN SMALL PITCHERS OR VASES –big blooms such as hydrangeas or peonies look gorgeous when cut short and placed in a short vase, pitcher or apothecary jar. Other ideas? Colored bottles, jelly or canning jars. The look is both fresh and elegant. The use of jelly or canning jars is especially creative for the Fall season as many people are looking to preserve all of those wonderful summer fruits! TALL VASE WITH STEMS – from a single stem in a tall slim vase to a handful of fresh cut flowers, flowers instantly say “welcome” to your guests and make simple yet elegant centerpieces. 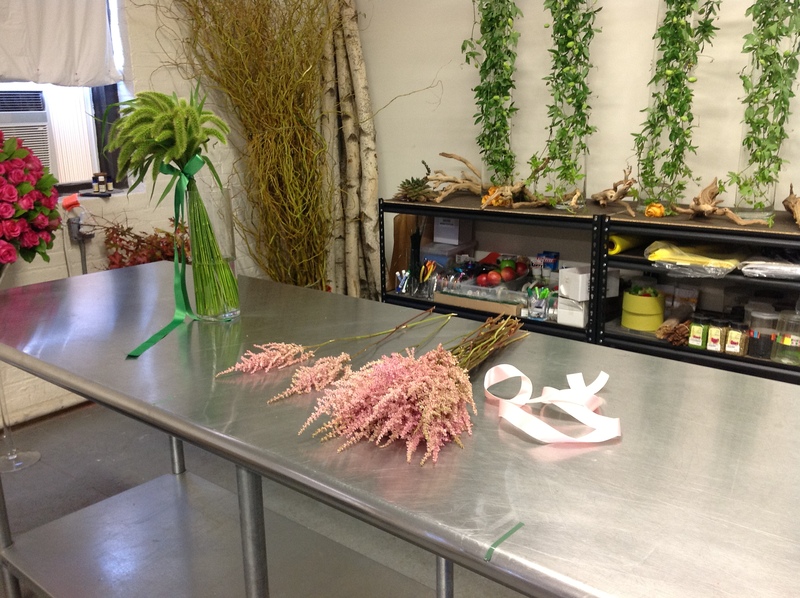 My suggestion when considering what to use, consider seasonal flowers that are appropriate for Fall including branches. GLASS HURRICANE/CANDLE ON A BIRCH COIN—a simple birch coin can add an instant natural Fall element to your décor and with a simple candle and glass hurricane on top can be an elegant centerpiece for a coffee or dining table. Other ways you can create this centerpiece include filling the hurricane with a layer of acorns and then placing a large candle on top! CARVED OUT APPLE OR ARTICHOKE WITH A TAPER CANDLE- whether it’s an artichoke or apple, carving out fruits and vegetables and inserting a tall taper candle can add instant appeal and really help you to celebrate “The Fruits of Fall” with your guests! SUCCULENTS IN MOSS AND SAND – Tiny succulents are hearty and simply look beautiful on a table. They also come in wonderful warm Fall colors like green and burgundy. Pair them with sand, moss or river rocks in a glass jar or vessel and you have a beautiful centerpiece. I LOVE this simple centerpiece I need, placing succulents in tall vessels filled with sand. DRIED FLOWERS –– Especially if you have a country or more traditional décor, dried flowers can truly be the perfect centerpiece choice. . Some modern takes on the use of dried flowers include use of cute, modern topiary as well as dried cotton plants, ideal for autumn. Dried flowers, great for Fall. ADD DRAMATIC FOLIAGE TO YOUR FLORAL ARRANGEMENT–Foliage is something we typically associate with Fall. What’s wonderful about foliage is how you can dramatically change the look and feel of the same arrangement simply by adding different foliage. The reality is, there are a number of different types of foliage out there from aspidistra to ivy to lily grass and passion vine as well as elephant ear leaves and each can completely change the look and feel of your centerpiece arrangement. Foliage can add so much to an arrangement! Especially as we all try to hold on to the last days of summer, so many of us want to enjoy the colors and texture of florals especially if you have a patio.Today we’re going to share with you some tips on how-to-make an arrangement of patio flowers so you can incorporate flowers into your outdoor living space. Step 1: First, pick a color and a type of flower that you like. Delicate flowers like hydrangeas and peonies are not ideal because they wilt quickly. For the longest life, pick a hearty flower like a sunflower, daisy or calla lilly. Step 2: Make a bouquet of your flower. We selected sunflowers and gerber daisies. 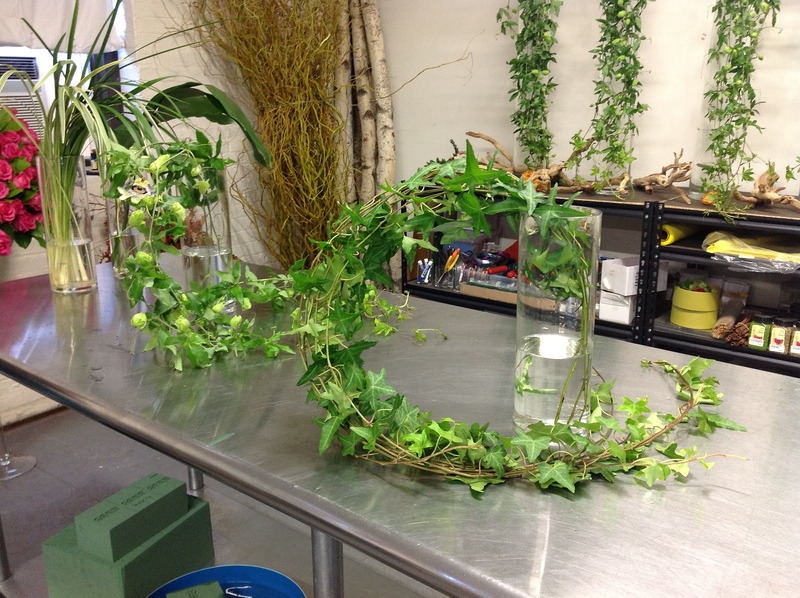 Step 3: Wrap vines around the bouquet to give it a more natural feel. Step 4: Place the arrangement in a vase with water. You can add leaves to line the vase, like aspidistra. Enjoy! This style of arrangement is modern yet casual, which makes it perfect for the patio or terrace. Be sure to check out our video next week!! In the meantime be sure to keep up with what we are working on! WELCOME BACK TO FLOWER POWER FRIDAY! 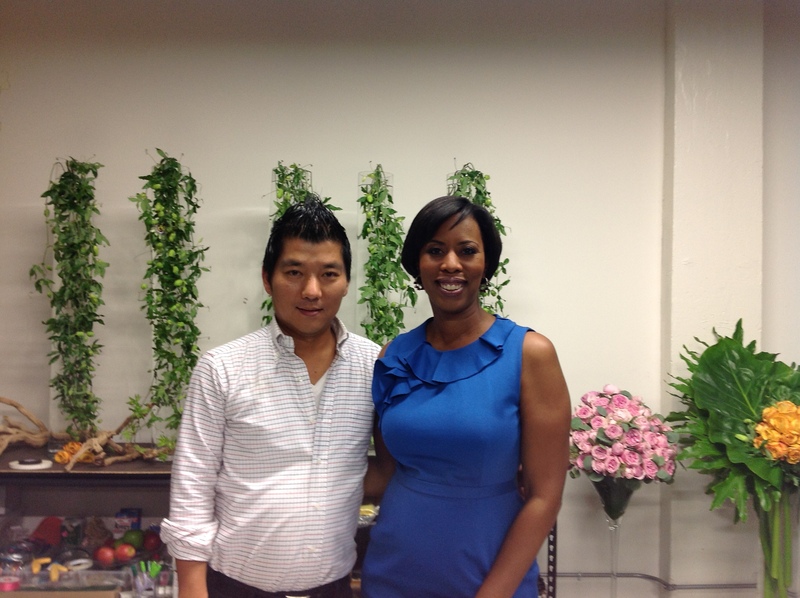 Hi everyone, as the owner of the NYC based interior design firm, Cathy Hobbs Design Recipes each Friday, Kenji Takenaka Floral artist and Master Designer at Noir Hanna International and I come together for what we call FRIDAY FLOWER POWER! 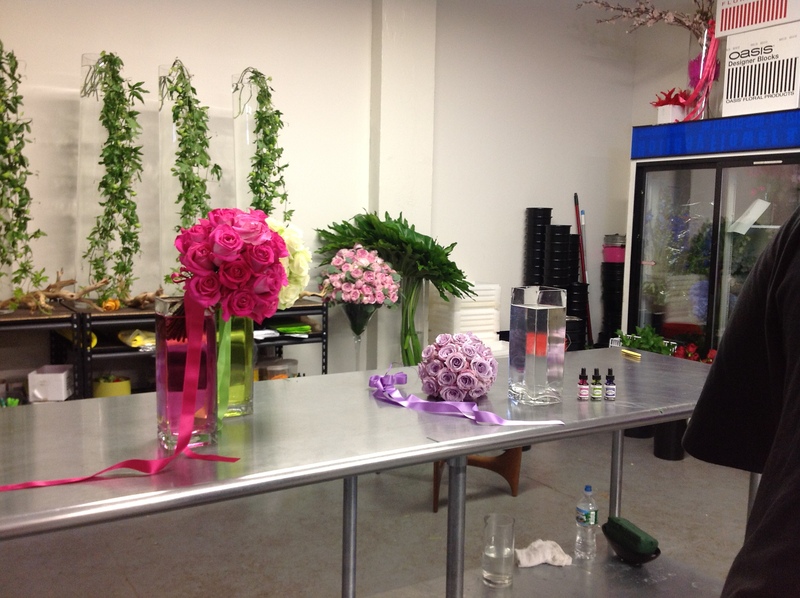 Each week we not only provide step by step instructions for creating dynamic floral arrangements we also provide a corresponding How To Video! When it comes to floral arrangements changing the color of the water in your arrangement is one way to not only make it stand out but to also make it more customized to your own taste and décor. But what is the best way to achieve this look? Yes.. this can be as simple as adding food coloring but another method is to use watercolor.. STEP 1: Begin with several clear glass vases filled with water. We use Dr. Ph. 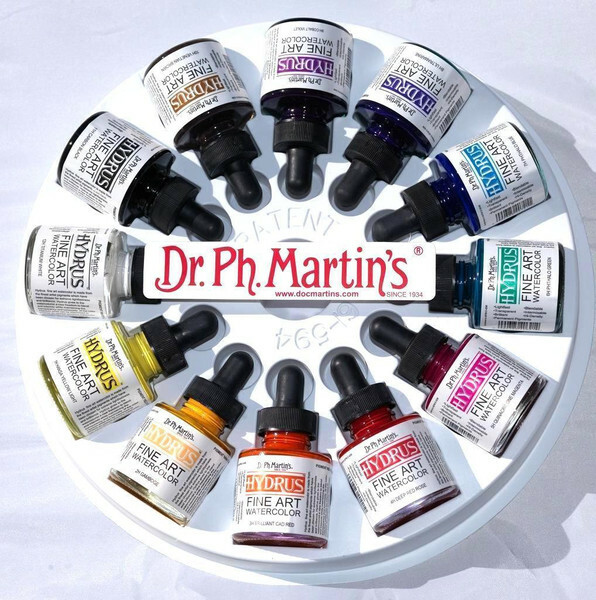 Martin’s water color, which you can find at any art supply store. Be sure to get the “radiant” concentrated water color. We like it because it’s very vibrant, and there are hundreds of colors, so you can pick the one you like best. STEP 2: Add 2-3 drops into the water and stir. STEP 3: Make a bouquet that matches the color of the water. STEP 4: And finally, add a satin ribbon in the same color to create a vibrant, colorful and unique arrangement. 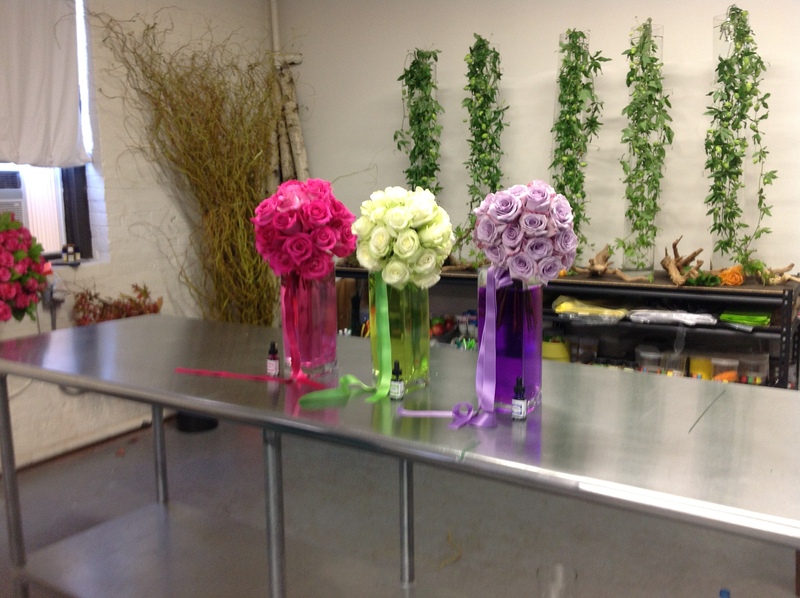 The result …a creative touch that you can add to any floral arrangement to create a colorful and unique bouquet! First and foremost, an Open House is an entertaining opportunity and like any other event that one may host in their home, an Open House is an opportunity for the home seller to showcase and make a statement about their own style and taste. It is important for a home seller at the all important Open House to create a “moment” for a potential buyer the second they walk in the door. The reality is most buyers make a decision about a property within the first three minutes, whether positive or negative, so it is critical that the first impression is strong. SMALL BOWL OF APPLES—fruit is not only affordable but creates instant color, other ideas include a bowl of artichokes, lemons or limes. TALL VASE WITH STEMS – from a single stem in a tall slim face to a handful of fresh cut flowers, flowers instantly say “welcome” to potential buyers. SHORT FLOWERS IN SMALL PITCHERS OR VASES –flowers don’t have to be in traditional vases, you can also place them in decorative water pitchers or apothecary jars. AFFORDABLE TOSS PILLOWS – toss pillows are relatively affordable and the right pattern and or color can really add impact to a space. If you want a budget, craft friendly idea, why not make toss pillows from affordable scarves. GLASS HURRICANE/CANDLE ON A BIRCH COIN—a simple birch coin can add an instant organic element to your décor and with a simple candle and glass hurricane on top can be an elegant centerpiece for a coffee or dining table. CARVED OUT APPLE WITH A TAPER CANDLE- whether it’s an artichoke or apple, carving out fruits and vegetables and inserting a tall taper candle can add instant appeal. SUCCULENTS IN MOSS AND SAND – tiny succulents are hearty enough to be around for lots of open houses! Pair them with sand, moss or river rocks in a glass jar or vessel and you have a beautiful accent piece. PHOTO COASTERS WITH A PHOTO/THEME OR FLOOR PLAN—imagine how this will appeal to potential buyers! All a home seller needs to do is print their floor plan out on a piece of colored paper and then mount it onto a piece of cork or stiff cardboard in order to create beautiful floor plan coasters. When it comes time to sell your home it is important for home sellers to remember that it is no longer their home, but a product on the market that will be compared to other products. 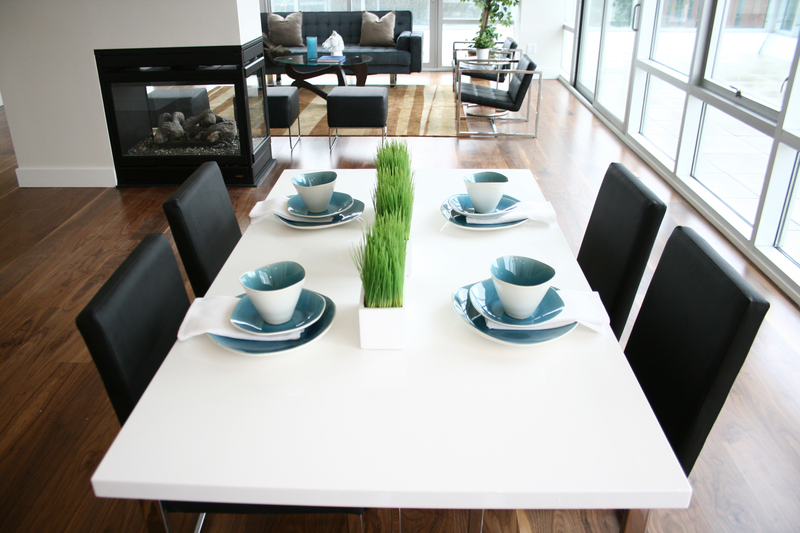 “Staging” is a proven technique in which a home is “styled” and prepared for sale. 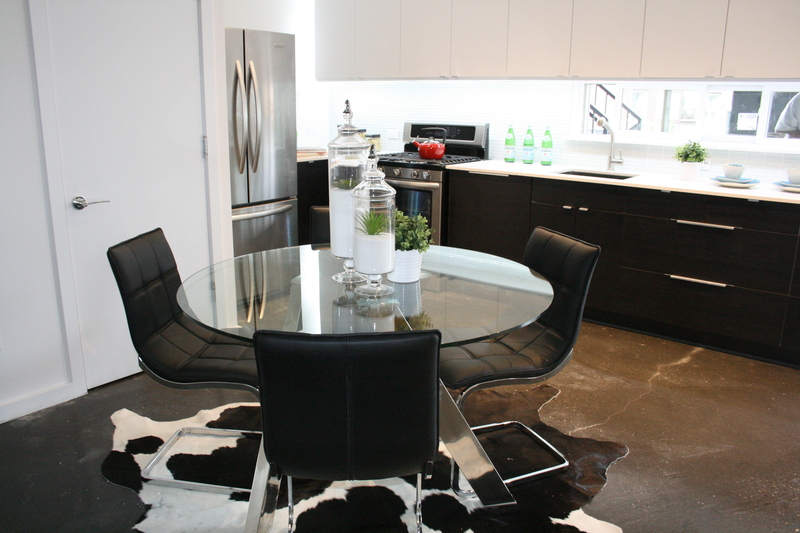 Here are some of Cathy’s tips for how one can “Stage for the Open House”. 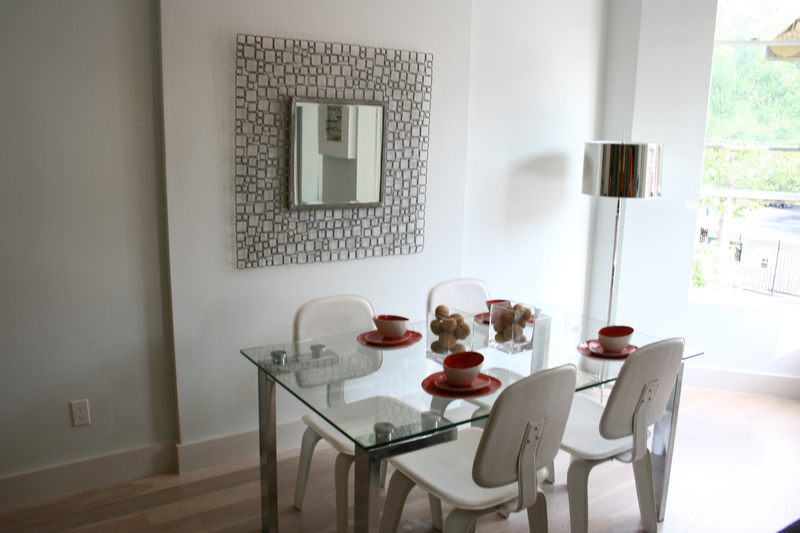 Dining rooms – whether setting the table or using table top items, setting the table can go a long way, as does creating interesting vignettes. I always say to my clients, if you don’t have attractive, appealing, bedding, purchase some! 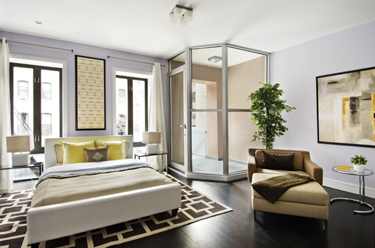 You don’t have to spend a lot of money, but a bedroom, especially a master bedroom should really look and feel like a sensuous retreat. Bathrooms—don’t forget the bathrooms! 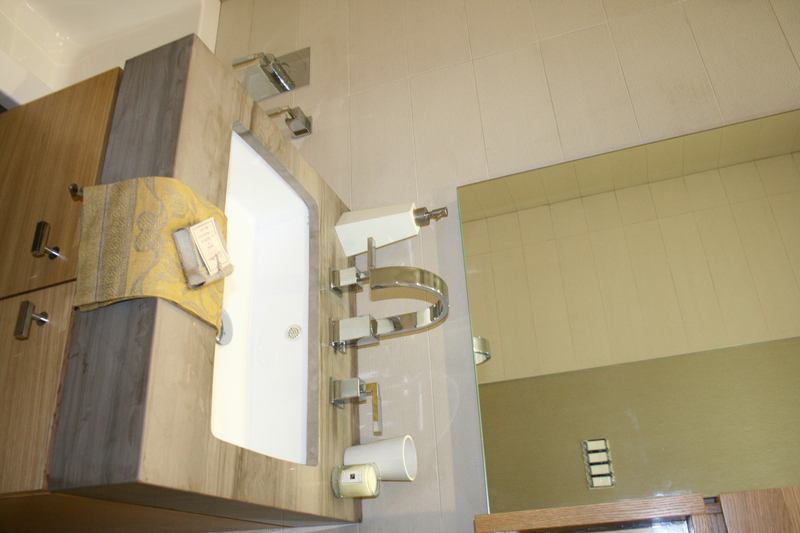 Many potential buyers still buy property based on their impressions of the kitchen and bathrooms. USE LOTS OF CANDLES (VERY AFFORDABLE)—candles are affordable and create instant glamour! 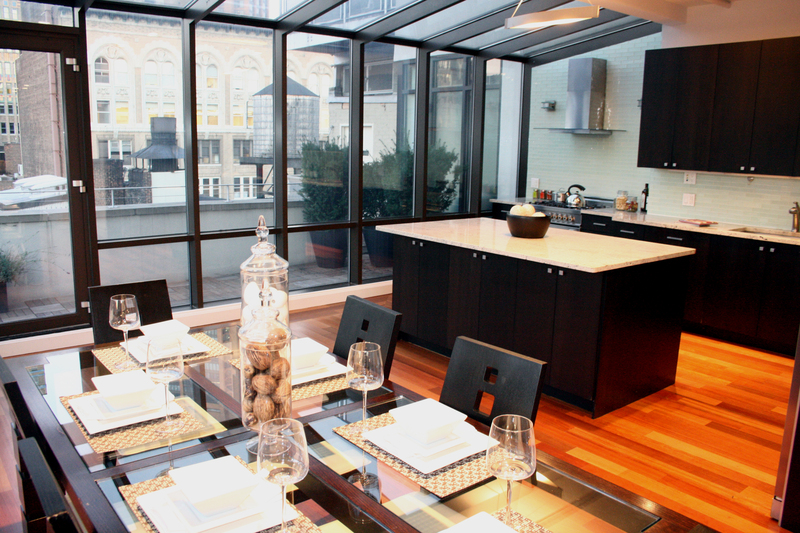 Remember an Open House is the perfect opportunity to entertain as well as entice potential buyers. 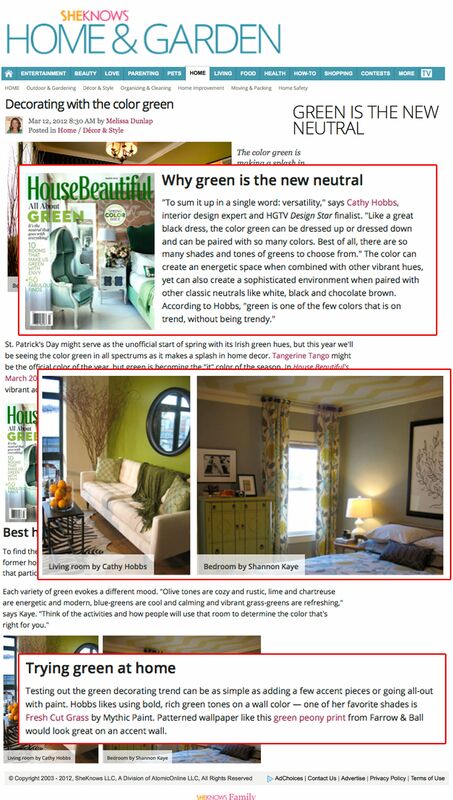 As an ASID Interior Designer specializing in residential interior design, I simply love using the color green. Why? To sum it up in a single word, “versatility”. Like a great black dress, the color green can be dressed up or dressed down and can be paired with so many colors. Best of all, there are so many shades and tones of greens to choose from. One of my favorite shades of green to use is the color of Jalapeno pepper. What I love about this rich shade is that its deep yellow undertones not only creates a bright, warm interior, but also looks so amazing with a myriad of colors, from pure white to eggplant and other citrus colors such as orange and yellow. The color green , also adds a level of sophistication to an interior especially when paired with other strong neutrals like white, black, and chocolate brown. 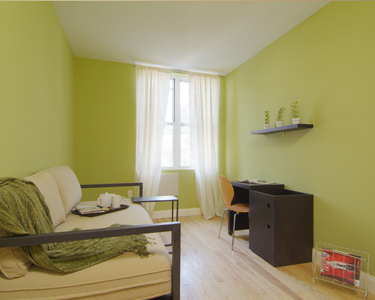 From painting an accent wall, to incorporating green into accessories such as artwork and toss pillows, there are a large number of options. I really love using bold rich green tones as a wall color and one of my favorite shades is Fresh Cut Grass (color 064-6) by eco-friendly paint company Mythic Paint. As their exclusive Brand Ambassador, I can also tell you that their colors go on silky and smooth and truly add luster to a room. Not ready to take the plunge? 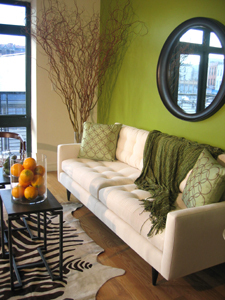 Well why not use bursts of rich green in your accent pieces such as artwork and accessories (such as toss pillows or bedding). While colors like yellow and amethyst work well with green, so do colors like blue, charcoal gray , as well as pure white, black and chocolate cocoa brown. Why is green the new neutral? I believe green is one of the few colors that is on trend, without being trendy. It is really a standard color that stands the test of time. Shades such as Hunter Green are often associated with traditional interiors, while shades such as dill pickle (which I’ve used in children’s rooms) and even chartreuse add a modern edge. Interested in more ideas? 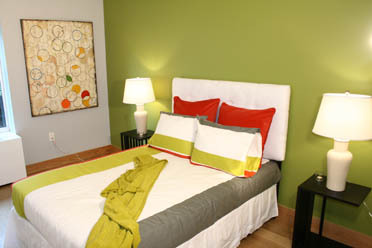 The popular on-line decor site SheKnows.com, shared with it’s 4 million unique monthly visitors for green decor. HOLIDAY TABLE SETTING IDEAS: New York City Celebrity Interior Designer and Home Stager Emmy Award Winning TV Host Cathy Hobbs Of HGTV Design Star Shares Tips With Shoptopia! ≈ Comments Off on HOLIDAY TABLE SETTING IDEAS: New York City Celebrity Interior Designer and Home Stager Emmy Award Winning TV Host Cathy Hobbs Of HGTV Design Star Shares Tips With Shoptopia! It may be almost Christmas but I’m thinking some of those tricks that worked for Thanksgiving entertaining can be carried over to Christmas. Sharing with you and lifestyle authority Shoptopia some of my top tips this holiday season! Tis’ the season! Happy Holidays everyone! I have to admit with just 10 days to go I haven’t bought a single gift, but I did purchase a Christmas tree the weekend after Thanksgiving. To me nothing quite sets the tone for the holidays than bringing a live Christmas tree into the home. Growing up my family used to have two trees in the home, one real and one fake. My brother and I ALWAYS preferred the real Christmas tree to the artificial one. To us, it simply looked better and smelled better. My mother to this day, still pulls out the same artificial Christmas tree that used to be in the home when I was a child. She loves the convenience. 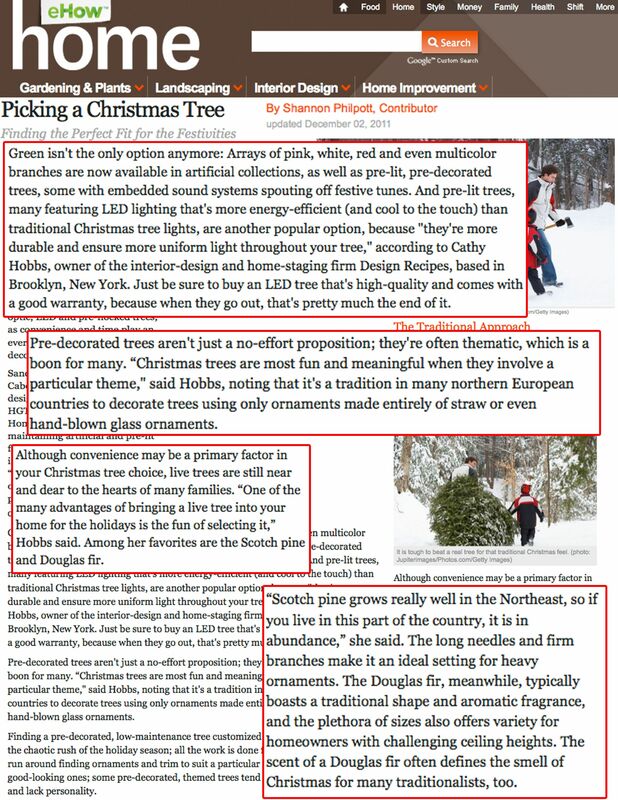 It is ironic that Interior Design and Lifestyle authority Ehow.com selected me to weigh in on the topic of real versus artificial trees…brings back childhood memories! Looking for Christmas Tree Decorating Ideas? Check out my Christmas Tree Decorating Tips as show on the CW Morning News! Thanksgiving is a time for family and of course GRAND ENTERTAINING! 5-time Emmy award winning tv personality and HGTV Design Star Season 6 finalist Cathy Hobbs shares some family friendly Thanksgiving entertaining ideas! It’s Almost Time For Turkey! 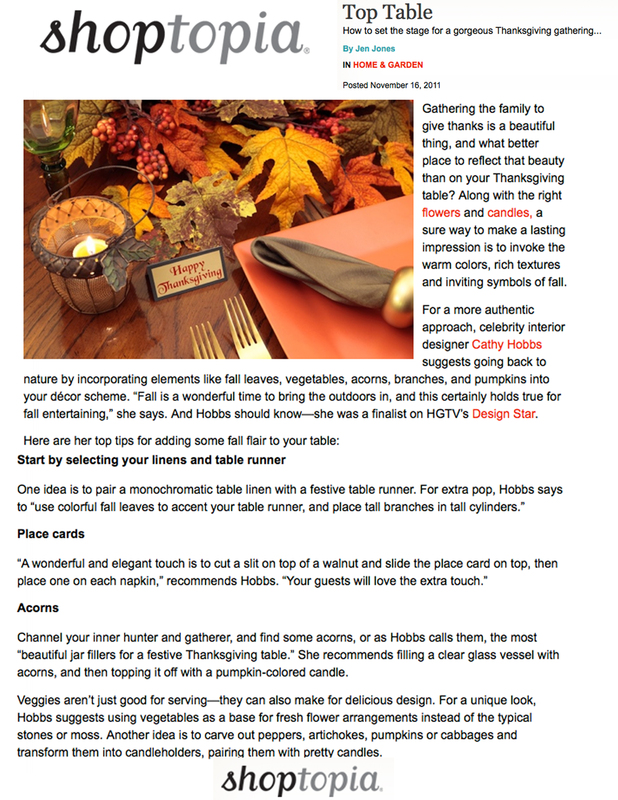 Celebrity Interior Designer Cathy Hobbs Shares Thanksgiving Decor Ideas With Ehow.com! ≈ Comments Off on It’s Almost Time For Turkey! 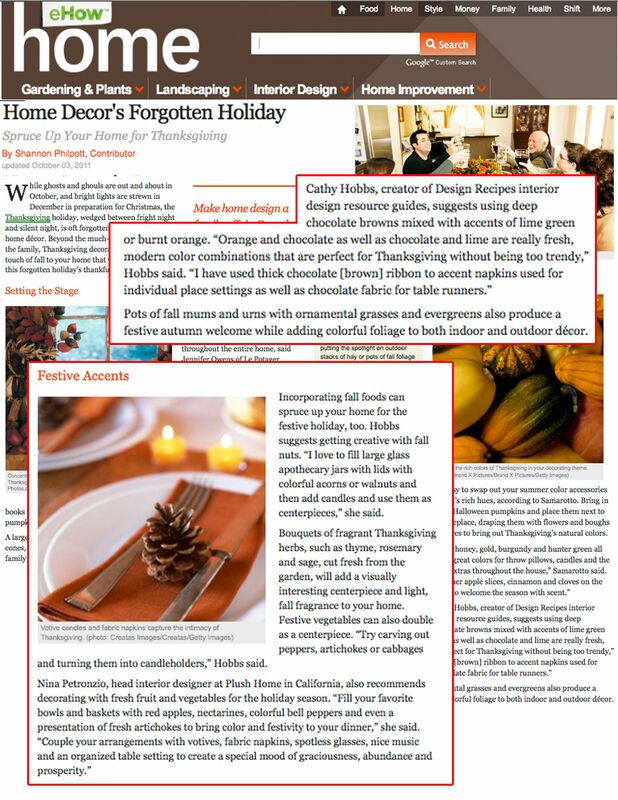 Celebrity Interior Designer Cathy Hobbs Shares Thanksgiving Decor Ideas With Ehow.com! It's Almost Time For Turkey! Celebrity Interior Designer Cathy Hobbs Shares Thanksgiving Decor Ideas!